Jacqueline was six years older than Didi and Didi worshiped her, wanted to do whatever she did. Kind Jacqueline always looked after Didi and didn’t seem annoyed by her little sister’s tagging along. Didi was christened Eileen, but that name never stuck. She was always Didi. When Jacqueline’s desire to fight the Germans led to her role as an agent doing undercover work for the SOE, Didi just had to follow even though Jacqueline had expressly forbidden her to do so. Jacqueline and Eileen Nearne were born in England during the First World War to an English father and French mother, and in 1926 the family moved to France. The children grew up feeling French until the Second World War changed things. When Paris fell to the Germans in 1940 the second son, Frederick, left France and volunteered for the RAF. Jacqueline and Didi decided to follow him to England and do something to help the war effort. Special Operations Executive was a secret organization that sent agents to occupied countries. Jacqueline’s flawless French brought her to their attention and she was trained to be a courier for the French resistance. Didi soon followed her to France as a wireless operator. The story is told in a straight forward manner with no unnecessary embellishments or added drama, just the facts. 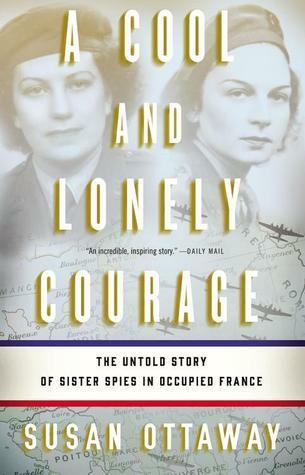 I knew very little about the French resistance and the role England had in supporting them with money and personnel, and I enjoyed this well written book that filled the gap quite nicely. Suitable for older teens. This entry was posted in adult, nonfiction and tagged French Resistance, WWII. Bookmark the permalink.